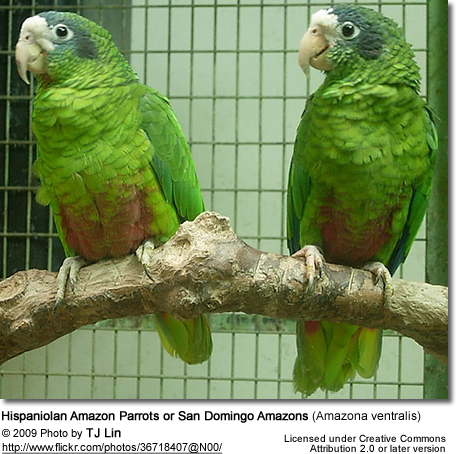 Hispaniolan Amazon Parrots or San Domingo Amazons (Amazona ventralis) occur naturally in the Dominican Republic, Haiti and some offshore islands, including Hispaniola and Gonave Island. It has been introduced to Puerto Rico. They are usually seen in pairs or small groups. Their numbers are sharply decreasing in their native habitat and they are uncommon in aviculture. 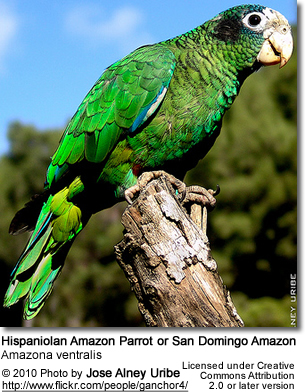 Hispaniolan Amazons are small Amazon parrots that average 28 cm or 11 - 11.2 inches in length (including tail). They are noisy and cautious, spending the greater part of their days eating and resting in trees. When in flight, they have a very heavy wing beat and are slow. Breeding season starts in April and goes on until about August. In their natural habitat, they nest in natural hollows or those excavated by woodpeckers in dead trees. These parrots are not easy to breed in captivity and when attempted, it is best to isolate breeding pairs from other birds. Although hearing other amazons in near-by aviaries may stimulate breeding. Their nesting box should be about 10 x 10 x 24 ins (25 x 25 x 26 cm) with the entrance hole having a diameter of 3 ins (8 cm). The hen lays 3 to 4 eggs, measuring 1.41 x 1.09 ins (35.7 x 27.6 mm). These eggs are incubated for 25 to 29 days, and the young fledge when they are about 7 or 8 weeks old. These parrots are not hardy and cannot survive if released in the wild. Due to habitat loss, hunting and trapping for the pet trade, the wild population is declining sharply. At this point in time, the population ranges from 10,000 to 19,000 in the wild and its numbers are decreasing. People often remove the chicks from the tree cavities and destroy the nest that may have been reused over the years. The lack of breeding successes is another reason for declining population. In the wild, Hispaniolan Amazon Parrots eat fruits, berries, seeds, nuts and possibly flowers. They are occasionally seen foraging in gardens and fruit plantations, occasionally causing damage to banana, guava, maize and cactus fruit crops. In captivity, a good quality unfortified / organic seed mix in addition to fresh fruits and vegetables should be provided, especially apples, carrots, bananas and citrus fruits, as well as rose-hips, elderberries, rowanberries, half-ripe maize and green food. They also enjoy s and pine-nuts. Because of their tendency to obesity, these amazons should given small amounts of sunflower or safflower seeds as treats, except when they are in breeding mode. Willow twigs should be provided throughout the year. In breeding season, a good quality mineral supplement and bread and biscuits for rearing should be provided.